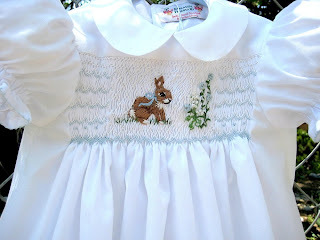 In honor of National Smocking Month I thought I would share this sweet bunny I stumbled across while surfing. It is also nice to think that spring will come again since a howling wind is blowing the snow around outside my window. While I was snowed in today I finished a project I will share tomorrow. Also have a stack of "want to do's" I need to cull down. I love him!!! Stay warm!!! Hi Martha, I would love to hear more about "National Smocking Month". Thanks for sharing this cutie. With a foot of snow on the ground outside, it's hard to believe spring will ever get here. I have long admired the Etsy shop where you found this dress! I wish someone would teach this lovely smocking/embroidering technique.